In the spring of 2016 Amsterdam finds itself, as per usual, at the heart of Europe’s debates. Over the next few months, it will host the drafting of a new European Urban Agenda, an opportunity to set a trajectory for the future development of European cities, at least from an EU perspective. It remains to be seen if that amounts to anything at all, but the question is a good one either way: what do we mean by the development of European cities? How should we develop European cities? These are complex questions at this point. This is a Europe that is both unraveling and consolidating, unevenly. Contradiction is everywhere. The compact and connected European city, exemplified by Amsterdam as much as anywhere, somehow continues to thrive in the face of economic, political and environmental crises, yet everywhere there is talk of new models, new approaches. Paradox reigns, and the centre is not holding. An overheated ‘property’ market for those with too much money is contrasted with crushingly low quality ‘housing’ for those with no money. A continent based for millennia on the free movement of people struggles with the idea of migration. Inequality is rampant in a continent that also boasts a set of spirit-level economies, with a bait-and-switch of the Dutch welfare state for a ‘participatory society’ yet to convince. The Netherlands holds the EU Presidency while Geert Wilders’s PVV is rising up the country’s opinion polls. Of course, Europe’s old cities have seen more destructive chaos than this before, many many times. And they rumble on regardless. Yet at the recent excellent Design & The City conference in Amsterdam, speaker after speaker stood up to sketch out possible trajectories for European urbanism, each informed by practice, by projects, and each ultimately, after the odd critique, positive and progressive. Few explicitly framed their contribution in terms of directions for European urbanism, but by the end of the day it was clear that this could be an emerging agenda. The platform was provided by The Hackable City project, an exemplary bit of academic work run out of University of Amsterdam and Amsterdam University of Applied Sciences — that is, ‘academic’ in the contemporary sense, and so co-designed, collaborative, located on the ground, and outputting accumulated learning through numerous channels. The speakers were international, though almost always rooted in Europe. Even the opening speaker, Tony Garcia of Street Plans Collaborative, showing some great projects largely from Florida, still located their grassroots tactical urbanism practice in Latino culture — and thus southern European culture, admitedly drawing a long bow. Garcia gave us a set of directives to frame the day with, which was useful, although it also felt to some extent like the USA beginning to catch up with years if not decades of emergent urbanism movements from Europe and South America. Garcia’s main project example concerned a disused rail-line being reinvigorated as a public space, a ‘trail’ alongside a new housing development. It’s an exemplary piece of tactical urbanism; careful yet purposeful self-starting activism. In the wake of the all-too-high-profile High Line (itself inspired by a European precedent of some 16 years, la Promenade Plantée in Paris—sometimes Americans are just better at marketing), this is part of what’s almost a ‘rails to trails’ movement in the US. For all that, the thought does occur that it is far more difficult to go from ‘trails to rails’, and that this too is a move we need to reinvent. A step beyond, from the tactical to the strategic, would be using evidence of emergent urbanism as a form of civic ‘R&D’—as an expression of the city’s latent desires. This would mean an urban development and design practice that facilitates such emergence, but also stitches and consolidates, building on momentum in order to achieve scale. This would mean scale follows desire, a reversal of the traditional Field of Dreams (“Build it and they will come”) desire-follows-scale model of urban development. In this Field of Dreams-mode, one has to try to falsely engender desire through the marketing suite, the show home, all those renders, all that lobbying. More importantly, however, it tends towards the overbuilt, the compromised, the costly, overly generic and wasteful ‘spec’ development. It rarely engages people—at all. Here, in contrast, the contributions of Matthijs Bouw and Kristien Ring stood out. 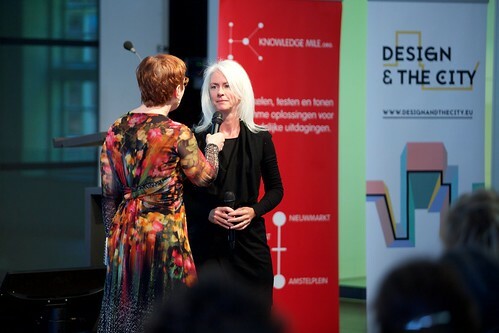 Both were engaged in more systemic interventions in reversed city-making: Bouw via the Buiksloterham project of citizen-led development at the scale of a district in Amsterdam; and Ring through her ongoing research into the Baugruppen model of citizen-led development in Berlin, usually at the scale of a building. In the former, Bouw described the series of ways in which Buiksloterham was prototyping a new form of district development, based on a simple, accessible financing model, AKA “real people building real houses with real money”, a sense of emergent coordination rather than traditional planning, and enabled by some light-touch technologies now at-hand, such as renewable energy generators, building fabrication and lightweight decision-making tools. Here we can already see that greater diversity of engaged citizens, bound by an ever strengthening social fabric, also affords a greater diversity of architecture and infrastructure. It will be fascinating to watch the evolution of the place, particularly the CityPlot project by housing corporation De Alliantie, Waternet‘s bio-refinery project, and the work of several local architecture firms, ‘leading from behind’ with the design, as opposed to simply coloring-in a masterplan. Ring’s presentation was also a highlight of the day, carefully unfurling her thoroughly documented and hugely valuable research on Baugruppen projects in Berlin, brought together in the book ‘Selfmade City’. The transformative potential of this scale-follows-desire model can barely be understated. Now approaching 10% of all developments in Berlin, this has long since outstripped its hippy roots and is emerging as the most viable model for good quality 21st century housing, as Niklas Maak also makes clear in supremely good book, ‘Living Complex: From Zombie City to the New Communal’. In evocative prose soaked in wit, Maak eviscerates the traditional Field of Dreams urban development model for ensuring a stunning lack of diversity in contemporary domestic architecture, particularly given how out of kilter this is with the reality of our century, never mind the vast amounts of inertia, cost (debt), and compromise it tends to involve. Baugruppen unlocks a diversity in design by — get this—building with citizens, and moreover with citizens whose level of engagement and motivation is without parallel, via their direct vested interest. Baugruppen enables an increasingly fluid, practical, playful and sensitive use of space in housing, by starting design with the specific needs and desires of particular people—in fact, perhaps more so than any other form of human-centred design. These are persons not personas. As a result, these structures are not simply hoisted up on blunt binary oppositions of private and public, or buy or rent, or single or family, or one- or three-bedroom apartment. Instead, they encompass almost limitless possibility, articulated through a use of space that shapes and defines through supporting and prompting particular living conditions, that balances suitable complexity with intrinsic accessibility, whilst also affording adaptability over time. Maak calls this “radicalising” the private space and the public space, and exploring the many subtle shades in-between, in shared space. In her presentation, Ring showed project after project that unlock joyous yet pragmatic urban conditions that are simply beyond the ken of traditional development models. It’s a wonderful body of research, bolstered by the kind of data required to capture the attention of policymakers. Baugruppen can no longer be filed under ‘only in Berlin’ but could be explored as a viable model elsewhere. As Maak and Ring both note, the diverse forms carved out of urban niches by these German architects has kindred spirits in the work of Japanese architects such as Sou Fujimoto, Atelier Bow-Wow and Kazunari Sakamoto, each of whom explore apparently more complex and “radical” housing propositions, each of which is actually no more complex and radical than everyday life itself. Here, we see new roles for designer as facilitator, with significant expertise to lend but within a flattened decision-making environment, as well as new kinds of infrastructure, digital and otherwise, and genuinely meaningful involvement of citizens as co-designers and co-owners. As these emerging moves concern the ‘dark matter’ of regulation, policy, culture and economy, as well as the matter of physical urban development, there is true potential for systemic change. Further talks included Frank Suurenbroek describing the circular economy potential in Amsterdam south-east, alongside Saskia Beer’s initiatives with the ZO!City platform, centred in the same areas. Joost Beunderman of 00 Architecture spoke eloquently about the need for such systemic changes in cities, colliding fabrication, libraries, food production and civic entrepreneurship. Liesbeth Huybrechts described similar projects in Genk, while Ben Schouten unpicked new approaches to empowering through play, in a practice-focused talk, before Thijs Turèl of Alliander presented thoughtful project work about making smart grid algorithms legible. Willem van Winden and Dorien Zandbergen both offered detailed critiques of smart city projects in and around Amsterdam. View all conference photos on Flickr. As a way of dealing with all these ideas, I found I could somewhat clumsily ‘file’ these contributions along an axis that organiser and curator Martijn De Waal had introduced at the start of the day, from work with Bouw as part of their Hackable City project. De Waal’s extremely useful organising framework for these civic projects described the potential symbiotic relationship between Individual, Collective and Institutional elements. It demonstrated the flow of value from one to another in the city, and how individual activities might coalesce into collective ones, and be further ratified, supported or scaled by institutional activity. Complex questions remain here but it became clear that, a few minor skirmishes aside, most in the Hermitage were on the same page. As the facilitator Tracy Metz pointed out, in her typically poised, patient and probing fashion, there was actually a danger that the room was something of an echo chamber, that we were a free-floating bubble of shared thinking. She simply noted that the room was largely bereft of policymakers or those in the property or finance businesses. So invoking the spirit of Cedric Price, I used my summarising presentation at the end of the day to pose a few potentially critical questions that I was left with, after all the talk. There was often discussion of how things might ‘scale’, as city-making discussions tend in that direction, for obvious reasons. One simple question is why should everything scale? It obviously needn’t. Should Baugruppen become genuinely commonplace? Should Buiksloterham conjoin with districts around to become a SuperBuiksloterham, and ultimately an Amsterdam framed around “small pieces, loosely joined”, to borrow an aphorism from the internet. Personally, I am intrigued by the latter thought, as I work within an industry that tends to crush things that don’t have an answer that looks immediately like “YES IT CAN SCALE”, and I would like to understand how such an iterative, networked approach might actuallywork. What is a network of networks of connected domestic-scale batteries, for instance? How do Baugruppen coalesce to form neighbourhoods, not simply buildings? How does on-demand ‘mobility-as-a-service’ counterpoint the base-load delivered by mass transit? How do we design an ongoing “Incomplete City”, where each stage of evolution is resolved and purposeful, and yet is open to adaptation, calibration and further growth? This is in part enabled by newer forms of distributed, decentralised infrastructure that I describe as ‘non-grid’. These would include: autonomous, predictive on-demand mobility services; local energy generation, storage and re-use; localised advanced manufacturing and modular, customised, recycled buildings fabricated on-demand; super-local decision-making tools, and so on. All of these are non-grid approaches, at least in comparison to the fixed mass transit routes, traditional energy grids, undifferentiated building offers, and delibereatly distanced representative modes of decision-making, which we might call grid-based systems. Key questions now include what we do on the grid versus what we do non-grid? How much can non-grid cater for, in terms of our traditional grid-based approach? How do non-grid and grid interplay? Does non-grid approach slowly iterate and coalesce into a grid over time? The sheer existence of a project like Buiksloterham poses these questions. We need to explore how to design for a deliberately incomplete city always—slowly, carefully—moving forwards. While these approaches would seem to have the characteristics of tactical or emergent urbanism, it’s potentially more sophisticated than that. My colleague Bryan Boyer has often noted an intrinsic problem with tactical urbanism principles of ‘pop-up as R&D’: it’s that pop-ups pop down; the reason they pop up is that they’re too easy, not a true test, they rarely deliver systemic change. So the challenge with tactical urbanism is when and how it becomes strategic, or even whether it can. At what point does it make sense to consolidate infrastructure, digital and otherwise, into something more larger, broader, without killing the accessible tactical impulses that kickstarted the innovation? The chess grandmaster Savielly Tarkatower allegedly once said that tactics is what you do when you know what to do, whereas strategy is what you do when you don’t know what to do. In other words, it’s obvious that a disused rail line might become a lovely urban trail, and this provides the necessary momentum to circumvent a bit of red tape. That’s a tactical manoeuvre. The tougher job is in exploring what else it could be. What’s the difficult, but ultimately necessary, thing to do? What does the place need longer-term? What would not just deliver to a niche, but across the population of the place? What does the transition from tactics to strategy look like? How do we know when we need to flip tactical to strategic? To consolidate distributed structures? Further, both participatory society (the Dutch incarnation of the UK’s long since-departed ‘Big Society’) and startup culture struggle with legitimacy. Neither seem to stretch or scale to universally accessible or equitable approaches—at least nothing that approaches that of the universalist welfare state model familiar to European social democratic urbanism. In other words, Uber is not public transport, and far from it, at least in terms of producing equitable outcomes, just as a community garden project, say, tends to occur in a certain culture or class of society and not in others. Crowdsourcing finance for projects, for instance, is a far from democratic process. It’s just money talking, essentially, just in smaller than usual increments. Over lunch in the Hermitage courtyard, in conversation with Kristien Ring, we realised that this heightened tension in the classic European social democratic city model, as it is the difference between the social and the democratic. Something can be socially enabled, articulated and manifest but it is not necessarily democratic. Again, the flow from one to the other may be the key question. In this sense, as Willem van Winden pointed out in his talk, we (in Europe) must wean ourselves off the idea of looking to the USA or the UK for a quick fix, for a simplistic answer — there is little evidence that either is working particularly successfully, at least when measured against the kind of higher-order successes we expect for European cities. While we do not always achieve it, we do often set the bar high in terms of urbanity and equality, and neither US nor UK seems particularly adept at achieving either, never mind both. But that does not mean we need reject wholesale the potential in popups and startups. The question instead is how we might learn from these undoubted innovations and selectively absorb their dynamics and affordances into systems and cultures that enable equitable access, that ensure meaningful representation in order to handle difficult decisions. I mentioned the ‘spiky innovation’ argument from ‘Dark Matter & Trojan Horses’ at this point, noting the potential for absorbing social innovations into more institutional forms that are agile and responsive when they need to be and, frankly, stolid and solid when they need to be. This sensibility might often be calibrated on the scale and duration of the decision in question; again, from the tactical to the strategic, depending on the stakes. In terms of the subject of much of the conference, however, the question is more directly whether we can carefully, sensitively and creatively co-opt the dynamics of contemporary technology for city-making in European cities. Can we disentangle and un-moor aspects of the decentralised character that underpins this tech, appropriating it for a quite different civic context of what Bart de Zwart calls “the decentralised character of the mid-size (European) urbanity” (OASE #89, 2013)? Coming back to the Hackable City diagram, and the flow from individual to collective to institutional, back and forth, we largely heard a day full of individual to collective flows, but little in the way of institutional. We are left with the thought that this right-hand side of the Hackable City diagram is, well, the tricky bit. How to reframe this institutional layer? As a kind of urban designer, loosely speaking, I also co-opt that question in terms of how it might change the form of cities themselves. I put up an image of a BIG/Heatherwick Studio render of an impossibly Californian scene from the Google Campus project in Mountain View, pointing out the lack of road, and all the traditional accoutrements of such things, due to the campus being designed around bikes and autonomous vehicles (AV). It’s a misleadingly arcadian image, but is intriguing in the sense that it asks what a street is once a non-grid approach is meaningful deployed. These technologies—the bike, as well as the AV—enable us to erase much of the damage caused by a previous era of urban technology, centred on the automobile. With a non-grid approach, everything ‘street’ actually becomes public realm. At least, these technologies potentially enable us to do this. The question is how that might happen, understanding the interplay between grid and non-grid-based systems as well as the shuttling back and forth between the tactical and the strategic, between the decentralised and centralised, between the social and the democratic, between the individual, the collective and the institutional, between the privately-owned, shared or public. Or, in other words, how a clutch of baugruppen coalesce into a future battery-powered Buiksloterham, and how this in turn interfaces with the civic infrastructures around it? Finally, what kind of cities could all this produce? Simply put, what does that look like? Less simply put, how does that produce a European city, the city as a public good? How do we take advantage of the sheer potency of the social but combined with the legitimate agency of the democratic? How do we meaningfully break the wasteful cycles of “build it and they will come” by enabling a city to systematically co-create itself, bit by bit? How, exactly, do we enable places to remain strategically incomplete—yet always coherent, pleasurable and productive at each stage of evolution—in order to encourage ongoing adaptation? These are questions that we didn’t hear quite enough of, Bouw and Ring aside, and even had they been voiced, the composition of the room was not quite holistic enough to address them. However, Design and the City, as a moment to draw breath and reflect, was still wonderfully useful in terms of foregrounding these and other questions, through descriptions of project, process and place rather than simplistic rhetoric. We may be left with more questions at the end of the day but at least, through these informed debates, there’s a chance that we’re one step closer to the right questions. At stake here is a feasible, viable and desirable set of trajectories for the social and the democratic coming together in 21st century European cities. Digital technologies and new cultures of design can ascribe a richer set of possible trajectories, yet they are risky tools when not handled carefully, without understanding their context and appropriating them for ours—and that means unpicking what “ours” means. Perhaps, then, the true question that day, and largely unspoken: what does the European city mean at this point? What could it mean?